There are 487 rooms and suites at the Metropark. Even a standard room comes with all the creature comforts you might need including air-conditioning, of course plus separate bath and shower, cable TV, radio, safe, hairdryer, mini-bar, fridge and international dial telephone. There are good options for families, with accommodation that will work for two adults and one or two children. 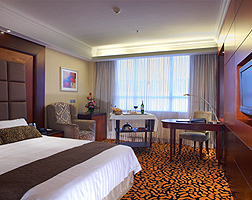 The Metropark Club Floor on the 17th level is devoted to the needs of the business traveller. The rooms are of Club or Club Deluxe standard, roomy and very comfortable, with a desk you can work at too. With access to the Metropark Club Lounge, you’ll have a complimentary breakfast, Happy Hour drinks and snacks, free use of a meeting room, as well as a full range of business services and equipment. A Club Suite has plenty of space, with a separate lounge furnished with a sofa, chairs and television. The President Suite is an enormous space, measuring 90 square metres. It has separate living and dining areas, a pantry and lots of little touches like luxury bathrobes.